This article submitted by Michael Jacobson on 4/28/99. For the seventh year, the Paynesville Area Elementary School hosted artists in residence last week. Children's author Phyllis Root was at the school all day on Wednesday and Thursday, and storyteller Sean Brown entertained the students on Friday. The idea behind the artists in residence program is to give students an inspiration in art and to give concrete examples of careers in the art world. 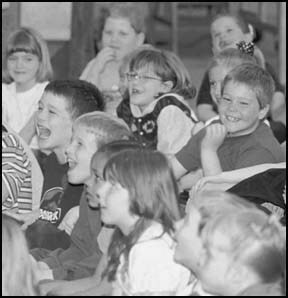 Over the years, the school has featured authors, storytellers, and visual artists. At least two authors have come back a second year. "We've had a great time with these people," said elementary school principal Gary Heineman. "Each one is a unique person." Heineman said the program allows kids a chance to see a real-life artist and to connect with them. "I think it adds another dimension to going to the media center and checking out a book by Phyllis Root," he said. Root has been a children's author for nearly 20 years. She had published 25 books and 12 more are under contract to be published. Her book, "Aunt Nancy and Old Man Trouble," won a Minnesota Book Award, and "What Baby Wants" won an Oppenheimer Platinum Award. A lifelong lover of books, she grew up in Indiana and now lives in Minneapolis. She got her start writing children's books by taking an extension class. Now she teaches an extension course on writing at the University of Minnesota and a mainly correspondence course at the University of Vermont for the Masters of the Fine Arts program. Even with 25 published books, Root is among the 95 percent of writers who can't support themselves solely by writing and has other occupations. She gave a slide presentation and talk to each elementary school grade in the two days. She talked about the writing process, how she came up with ideas, and how books get published. She explained how she got ideas for certain books, and answered questions from her audience. With the third and fourth graders, she also had them work on writing a story. She said she was knocked over by the kids. "They're so creative," she ex-plained. "It's really fun for me to be in schools." She said the students are taught much of what she tells them in the regular classroom and she just reinforces those lessons. "These kids know so much about writing it's like talking to other writers," she said. "It's re-energizing." She considers the inspiration she might provide to be very important. "Why do people start to think they can't write?" she wondered. "They need to thnk of themselves as writers because they are." She felt the positive reinforcement she provided the kids was exciting. They gave her reinforcement, too. "I think it's just a good reminder about why we write stories," she said. "We write stories for people who read stories." Sean Brown was also impressed by the students at the elementary school. "They're attentive and they're playful and they're really willing to embrace the new experience," he explained. "They're trusting, too." Brown majored in physics and computer science at St. John's University in Collegeville. After graduating, he wanted to have the opportunity to express himself and avoided getting a regular job in his field. He lived and worked in a homeless shelter in St. Cloud and then started working as a preschool teacher. 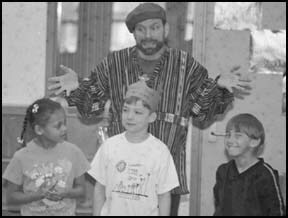 He discovered his gift for communicating with kids and worked as a professional storyteller for 10 years, from 1988 to 1998. He performed at schools, libraries, churches, conferences, and festivals. Last year, he started working as a computer network engineer, and now he splits his time between that and storytelling. "I think what's really allowed me to be successful in (storytelling) is paying attention to the audience," he said. He tells different stories to different audiences. When he was telling stories full-time, he had a repertoire of 200 stories. Now he relies more on his favorites. At the elementary school Friday, he told seven different tales. Most of his stories are his own, but he also used a legend from Japan Friday and an African folk tale. His dramatic style includes his own actions, audience participation, and possibly some actors from the audience. He described "The Three Little Skunks" as his signature story. It used four actors: Three Little Skunks and the Big Bad Wolf. His stories include subtle themes about empowerment, respectfulness of differences, and other traits he admires. He doesn't try to push an agenda, though. "I think storytelling is a very respectful way to teach," he explained. "If it resonates true to the listener, it's going to strengthen their resolve." When Brown became a full-time storyteller, he didn't consider that it couldn't be done. He never gets to check a box for his occupation on a standard form. He has to list his occupation under OTHER. The chance to be an artist in residence allows him to help kids be creative. "I think that it is important to instill in kids that there are unlimited possibilities and potential," he explained.